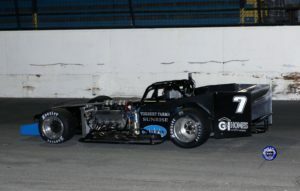 Oswego, N.Y. – Dave Shullick Jr. and Otto Sitterly dominated Novelis Supermodified action at Oswego Speedway Saturday, June 9, with Shullick scoring his second 50-lap feature win of the young 2018 season and Sitterly finishing right behind in second for his third top-five finish in three races. Behind the wheel of the potent Futuri Media No. 2, Shullick’s latest feature win gives the G&I Homes / CORR/PAK / Riccelli Northern-backed Nicotra Racing team 36 wins in Oswego Supermodified competition, moving Nicotra into a tie with Tom Heveron Sr. for fifth on the all-time Car Owner win list. With Sitterly finishing second, the team now has five career one-two finishes at The Steel Palace. The Shoe II advanced from seventh to fourth by lap 5 and into the third position by lap 10. Now trailing only Abold and Gruel – and with Otto hot on his back bumper – Shullick advanced to second when Abold dropped out with engine issues on lap 25 and then would make a competitive pass on Gruel just past lap 30 to take over the lead. From there, DJ would negotiate lap traffic like a pro with Otto, who followed DJ past Gruel for second on lap 31, waiting to make a move for the lead. The opportunity Otto was looking for would never come as Shullick led Sitterly across the finish stripe by a mere 0.331-second gap. Sitterly, whose second-place finish was good enough to gain him the point lead for the first time this year, started ninth on the grid and battled hard to get to second, nearly passing DJ on multiple occasions. Otto, still searching for his first feature win since Sept. 20, 2015, has been the most consistent driver so far this year. With finishes of fourth, third and second, he’s the only driver to finish top-five in all three features thus far. 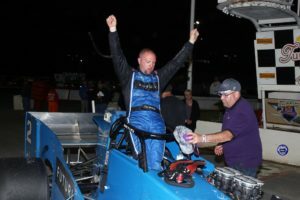 With three features down and nine remaining, Otto leads the Oswego Novelis Supermodified standings by six points over Keith Shampine with DJ seven points back of Otto in third. We’re back in action this Saturday, June 16, for Twin 35-lap Supermodified features at Oswego. John Nicotra Racing is a Supermodified race team owned by John Nicotra with drivers Otto Sitterly, Dave Shullick Jr. and Davey Hamilton. Since our team’s debut in 2007, Nicotra Racing and has won five Budweiser International Classic 200s, seven Oswego Supermodified track championships and currently 36 total Oswego feature races since their debut in 2007 – Otto Sitterly (28); DJ Shullick (7); Davey Hamilton (1). Nicotra Racing is proud to be sponsored by G&I Homes, Riccelli Northern, CORR/PAK Merchandising, 5 Brothers Produce, Burnac Produce Limited, Provincial Fruit Co., Flavor First, Georgia Crate & Basket, Rite-Pak Produce, Quality First Produce, Sam Accursio Farms, Ritz-Craft Homes, Torbert Farms, Elite Harvesting, Futuri Media and Sunrise Growers.